This is a 2-day hands-on pruning intensive course which will cover everything you need to tackle an apple tree, young or old…kept or abandoned. Day 1 will cover the basics of pruning, from tree physiology to how to make a pruning cut to the considerations that go into making a cut. We’ll cover all sizes of apple trees from just planted to deer browsed to juvenile to mature trees. The day will end with participants breaking into supervised groups and working on trees. Day 2 will put into action all that we learned the day before, only this time we mean business. We’ll cover how to prune the big, burly, and the old. We’ll also cover top-working (changing a tree over to another variety) and the steps needing to be taken in order to graft a tree over to a new variety in spring. This class will be capped at 20 participants. Cost Per Person: 2 day workshop is $110, 1 day is $70. Overnight lodging can be made available, ask for more details. In addition to money, work trade and barter are both acceptable means of payment. CLICK HERE TO SIGN UP! And this spin off from Jill Neimark’s NPR piece just happened, this time in Food&Wine! Bruised and scabbed apples have more antioxidants and sugars because they’ve fought off natural stressors. Grocery shoppers don’t generally make a beeline to the scabbed and blemished apples. But maybe they should. New research shows that trauma to the fruit—stresses from fighting heat, bugs, and fungus—forces apples to produce antioxidants such as flavonoids, phenolic acids, anthocyanins and carotenoids. And these compounds have all kinds of nutritional value. 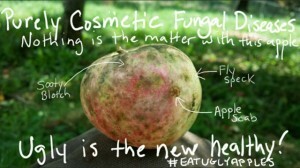 A spin-off article from yesterday’s NPR article on eating ugly fruit, this time on weather.com! I’m so psyched this is getting attention. It’s only the beginning!! Let’s face it: ugly fruit gets a bad rap. It’s often left behind at grocery stores and sold at steep discounts at farmers markets. More often than not, it gets tossed on top of an ever-growing pile of wasted produce. But it turns out, these ugly fruits are fine to eat – and they may even be more nutritious. NPR wrote an article about #eatuglyapples AND IT ALL STARTED WITH THIS BLOG! Unsightly scars on the outside of fruit might reflect higher nutrition within. When orchardist Eliza Greenman walks through a field of apple trees and gazes upon a pocked array of blemished and buckled fruits — scarred from fighting fungus, heat and pests — she feels a little thrill of joy. “I’m absolutely infatuated with the idea of stress in an orchard,” says Greenman, who custom grafts and grows pesticide-free hard cider apples in Hamilton, Va. These forlorn, scabbed apples, says Greenman, may actually be sweeter. This is an essay written by my friend Barb Fernald for the Working Waterfront newspaper in Maine. She gives me a big mention! You can click to it here! Fall has been a season of superlatives in the Cranberry Isles. Along with a November that might turn out to be the warmest on record, in Maine, the foliage has been the brightest we’ve seen in years. A simple walk or trip to the mainland begs one to pull out the camera time and again. Best of all, this has been an amazing fall for apples. All over the islands the trees have been loaded. On a November Saturday, I caught up with my neighbor, Kaitlyn Duggan, and her two-year-old son, Bode, as they were going down the road by our house. They were each eating an apple from the tree in Mark and Vicky Fernald’s yard. We commented on the tree filled with yellow apples by Jack and Ellie’s house on the edge of the Sand Beach. “I’ve probably picked six grocery bags full from that tree this year,” she said. I and many others have been to the same tree several times, picking up drops and reaching the low branches to pick, with a view of the Islesford harbor. It seems like it has rained every day for the past month in the Champlain Valley of New York and Vermont. Combined with 70-80 degree temperatures, the fungal population couldn’t be happier. It’s like one continual fungal feast over here, and I couldn’t be more psyched. Why? Because I’m absolutely infatuated with the idea of stress in an orchard. In A Radical Orchardist: Part One (which I encourage the reader to read before pursuing this essay), I re-introduced my thoughts about how apple scab, a fungal disease, increases the brix (sugar content) of the apple, which translates into a higher alcohol content once fermented. For hard cider purposes, I thought, perhaps we shouldn’t be spraying-late season fungicides for cosmetic fungal diseases like apple scab, since lingering fungicide residue has been known to kill the ferment (the yeasts) in the wine and cider realms. I also re-introduced the idea of managing apple scab as a value-added disease for cider apples, a thought that is about as radical as it gets these days in the apple world. A thought that I’m still excited to explore and understand in order to embrace it or dismiss it. This year, I’ve been actively looking for scientific research on the effects scab has on apples, from a nutritional standpoint. I want to know how the apple reacts to scab; What does that fight look like? Does a stressing agent like apple scab bring about super fruits? This research is slow, mostly due to the fact that I don’t have access to any scientific journals, but it’s progressing and has me optimistic. The following is a report on my findings and thoughts. My journey started when I found a paper about the effects of apple scab on the peel of an apple. The article, which can be found here and simply broken down here, stated that a peel covered with scab lesions is higher in polyphenols than one not covered in scab. What’s the big deal? Quite a bit, actually. This is a big deal. 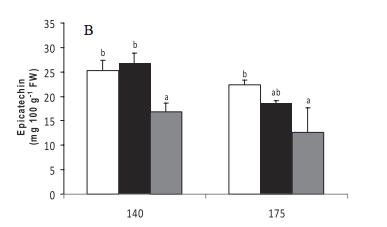 Phenols, such as chlorogenic acid (as seen in the top graph), are classified as antioxidants, meaning that they tend to prevent or neutralize the damaging effects of free radicals in the body. Free radicals are chemicals that have the potential to cause damage to cells and tissues in the body. Many of the phenols mentioned in the paper above are related to resveratrol (the polyphenol found in red wine which got a lot of news a while back for making wine drinking a life-saving activity). 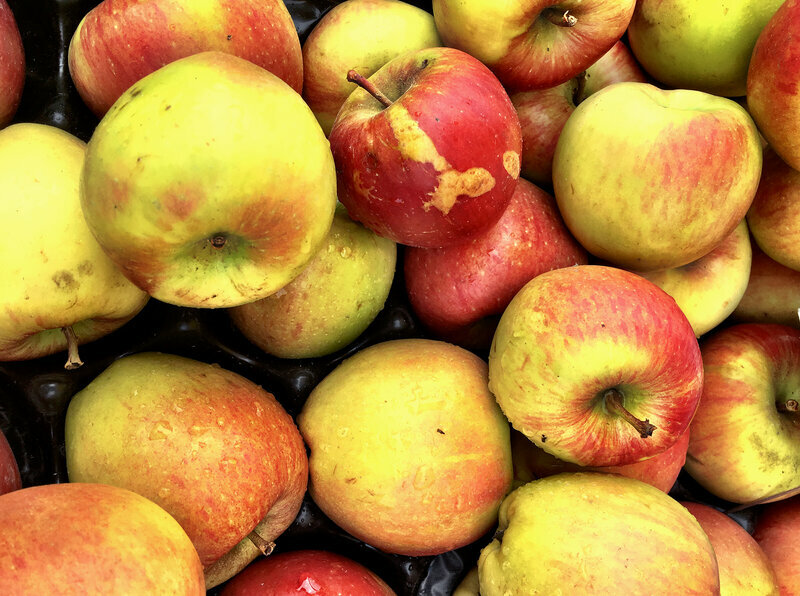 When researched in the skin of non-scabby red apples (aka: what you see in a grocery store), they were found to contain powerful antioxidant capacities, along with anti-cancer, anti-inflammatory, and cardio-protective properties. 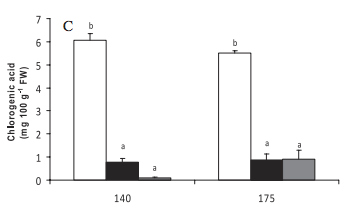 The way in which orchards are managed can influence the amount of phenolics, as shown by Veberic et al. (2005), who reported that organically grown apples had somewhat higher amounts of phenolics as compared with traditionally grown apples. These authors concluded that this is probably because organically grown apples face more stressing conditions, for synthetic fertilizers and pesticides are not used. Folks, this is superfood status and at the very least, people should try to source ugly organic apples and eat the peels. Research says that doing so might save your life someday. What makes a cider apple a cider apple? The quick universal answer most people know is that it’s in the tannin. Tannin is a collection of phenols such as chlorogenic acid, phloridzin, epicatechin and the procyanidins (source). Only the procyanidins are considered “true tannins” because they have the ability to tan things like animal hides and give the drying sensation we recognize as astringency (aka: the sensation you get when you stick an acorn in your mouth). For the most part, bittersweet apples have the most tannins, or phenolics, and dessert apples have the least. If there is one style of apple prized above all others by American cider makers, it’s the bittersweet apple. Affectionately referred to as a “spitter,” these apples are low in acid, high in tannin, and impart the classic flavor of finer French and English ciders. At first bite, most would consider bittersweet fruit inedible. But what is ill suited for the fruit bowl is ideal for the cider press. For the most part, America’s high acid, high sugar apple crop provides all the fuel for fermentation and puckering power necessary for a great cider. But what that fruit lacks is tannin—the molecules that impart astringency and provide a cider’s texture—and bittersweet apples fill this void. I hope your wheels are turning like mine were, but in case not, let me break it all down for you. Cider apple varieties are known for their higher levels of phenolics, because those phenolics (aka tannin) distinguish them from dessert fruit. Those phenolics involved in making a cider apple a cider apple are also the same phenolics that increase in concentration when the apple is stressed with apple scab. 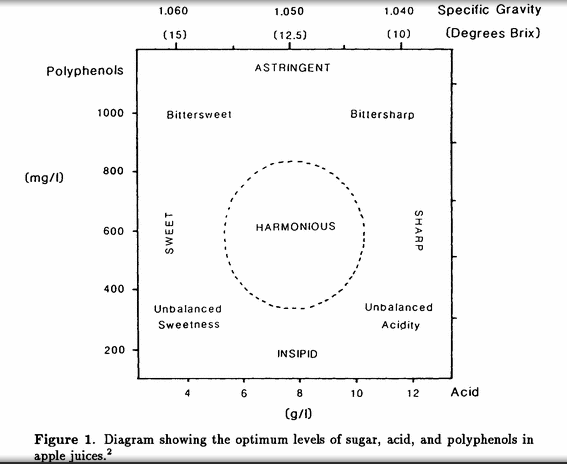 If you refer to Figure 1 above, you’ll also see that in addition to high levels of polyphenols, a bittersweet apple is one with a higher brix. Let me remind this audience that this whole Radical Orchardist series started with the deletion of an article I wrote about how apple scab increases the brix in apples. I’m no chemist, but it seems to me that stress has the potential to send some dessert varieties into the realm of a bittersweet. Now, how about stressing a cider apple? 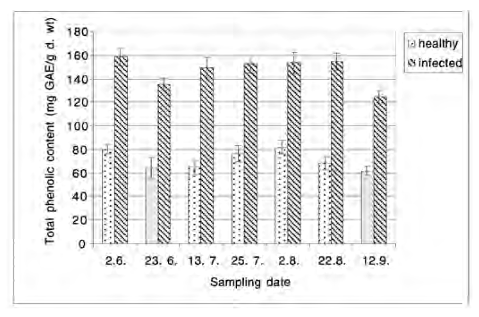 Is the increase in phenols due to stress worth it to the cider maker and the consumer? 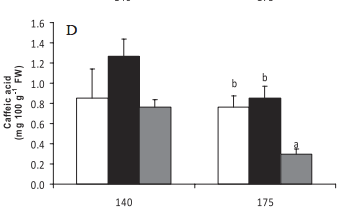 This study says that phenols in hard cider are absorbed, metabolized, and excreted by humans. Meaning, we’re getting the nutrients. It makes sense to me. When stress occurs, the apple’s response is to pump the site of infection/attack full of phenolics (see graph to the right) . Look no further than your forest’s edge to find wild, highly evolved, inedible tannic crabapples that serve my point. The crabapples have evolved to contain these phenolics without provocation. 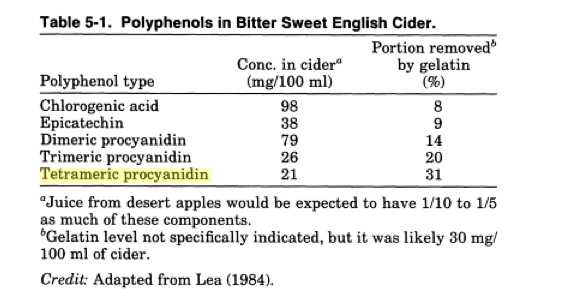 The lesser-evolved dessert varieties, however, may need to be provoked through varying degrees of stress in order to produce a more nutrient-dense product, or one that more resembles a bittersweet cider apple. What is a cider apple? Sure, you can have all the old French and English varieties like Dabinett, Frequin Rouge, Tremletts Bitter, Norfolk Beefing, etc, but if they are managed the same as dessert apples…are they really cider apples? I don’t think so. And I still don’t think so. I believe that growing cider apples requires a completely different mindset than growing dessert fruit in order to make high quality, nutrient-dense, healthy organic hard cider. To me, a part of being a cider orchardist involves learning how to balance stress within the orchard through organic means. What do I need to give the tree in order to replenish the expense of fighting off an infection? What is the tipping point of too much stress? I whole-heartedly believe that these, plus many more, are the questions we should be asking. Imagine a world where the value of an apple comes not from its looks, but from its nutrient content. That’s what I’m aiming for with stress, and I believe there is value in that. Please, those of you who are researchers…prove me wrong. I have admitted to the fact that I’m no chemist, and without academic ties, its completely reasonable that my understanding is flawed from the free book snippets and articles I find online. Send me a response with accessible PDFs, I’ll make sure to post it in a follow-up essay with reasons why I agree or disagree. Hopefully some great questions will come out of it and some university or private foundation somewhere will want to investigate. 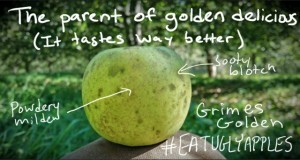 In the meantime, the take home message is to #eatuglyapples and #drinkuglyapples. Embrace the scab, avoid the rot and challenge the status quo. 6.5 times more phloridzin than a healthy apple. procyanidans are flavanols, which are widely cited by research papers to be the reason why some apple varieties are resistant to scab. May 9th: Fruit Tree Topworking Workshop! Imagine a single apple tree in the spring blooming with a bouquet of white, pink, red and purple flowers. Imagine that same singular tree with red, green, yellow and russeted apples in the fall. That tree is possible to obtain if you learn how to topwork. Come and learn the art and technique of adding different varieties to a tree. 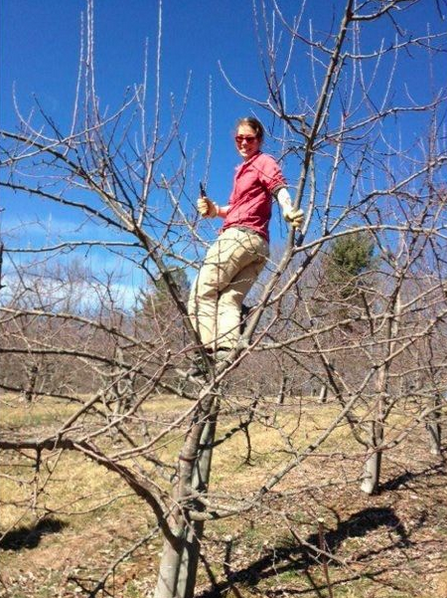 On Saturday, May 9th, heirloom and cider orchardist Eliza Greenman will walk you through the steps necessary to change an apple, pear, or hawthorne tree over to something you find more useful to your lifestyle. Whether you want to convert an abandoned orchard over to different varieties, or you are tight on space and want one of your trees to supply great pie apples for every month of the apple season…the learning starts with topworking. Cost: $15 per person. 15 slots available. Cider apples are different from your normal grocery store apples. Not just in variety, but also in management technique. Come take a walk through the orchard with heirloom and cider orchardist Eliza Greenman to learn the basics of good and bad when it comes to growing apples for hard cider. We’ll identify and discuss beneficial insects and cosmetic diseases, concerns and triumphs in the orchard, and tips/tricks to deal with these concerns. The goal of this workshop is to have the participant leave with motivation to experiment, make observations, and join a network of people working to supple and make quality products which do not harm local ecology or the consumer. Cost: $15 per person. 20 slots available. Pruning is a practice and art of addressing vigor in apple and pear trees. When practiced in combination with dormant winter pruning, a tree is able to produce more fruit and have less disease. Come learn the basics of tree vigor, how soils and winter pruning can interact with the vegetative growth of your apple trees, and how to bring the tree back into balance through summer pruning. Learning from the landscape is one of our best tools in combating climate change and forming a more sustainable agricultural future. If you know where to look and what to look for, the landscape transforms itself into a realm of purposeful human legacies and thriving natural adaptations. Fruit Explorer/Orchardist Eliza Greenman will teach you how to track human legacy through trees, select for wild and thriving genetics, and how to propagate it all through summer bud grafting. Cost: $25 per person. 25 slots available. What to Bring: Camera, notebook, single beveled knife (grafting knife preferred), footwear and clothing for walking outside, sun protection. This workshop will cover all the basics of making hard cider, from pressing to fermentation. Participants will take home a fermenting kit and a 5 gallon carboy of cider to ferment at home. Cost: $100 per person. 20 slots available. This PRX radio interview took place last year and was released in March 2015. Some things have changed (like not currently having a farm in Virginia…) but it’s a nice listen overall. When you walk through the produce section of a grocery store, it’s always the same view once you get to the apples. Large, glistening orbs of pristine red, yellow and green apples are neatly piled on the shelves, their looks alone inviting the shopper to add them to their cart. So you pick one up and scrupulously examine it to make sure nothing is wrong, add it to your cart, and move on with your purchases. As an apple grower in Southwestern Virginia, I’d like to use four words to tell you what I think about these pristine apples at the grocery store: I won’t eat them. It’s not just because they often taste bad (Red delicious – seriously? ), but also because how they are grown. You see, that pristine, blemish-free beauty is a result of management – apples do not naturally look like that in Virginia. Left to its own devices on a tree (and it depends on the apple variety), an apple would likely be covered in a smattering of cosmetic diseases. These diseases do not alter the taste of these apples (aside from sometimes making them sweeter) and are not in any way an indicator of your apple having a worm. Yet we Americans have been trained to eat beautiful fruit and reject the blemishes. 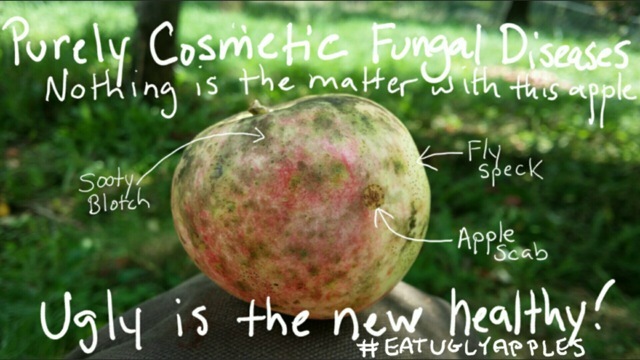 Because we fear these harmless blemishes, millions of gallons of fungicides are sprayed on apples (organic and conventional) every year across the United States to make them go away. That person on the tractor in a white tyvec suit who is being followed by a white plume of chemical spray – that’s me, Eliza Greenman, age 30. No matter how much I try and cover-up with all of the necessary gear, I get those chemicals on me at a higher concentration than what lands on the fruit. I’m one of the youngest orchardists in the country by a generation and hope to have a long life ahead of me so I’ve started a campaign to reduce the threats on my health as the farmer, your health as the consumer, and the environmental impacts from farming practices. Eat Ugly Apples. Making the conscious choice to eat ugly apples is better and cheaper for you as the consumer, protects environmental quality and it’s better for me as the farmer. It’s time we challenged the social norm that currently has us demanding glistening orbs of perfection from the growers. This takes some awareness and I’m here to help. Consider eating varieties of apples that you’ve never heard of before. There are 7,000 different known varieties of apples in North America and many of these are better suited for growing in the hot and humid Virginia climate. For example, apples called “Russets” look like potatoes and aren’t very susceptible to many of the cosmetic diseases. They taste amazing. Ask for them and keep asking for them! Learn the blemishes. I’m convinced that corporate agriculture named these diseases to sound much worse than they actually are. Sooty blotch, fly speck, apple scab and powdery mildew are the top four cosmetic diseases. My pictures above should help you identify them. Spread the ugly apple gospel! Bring down those naysayers with assurance that they will not get sick from eating sooty blotch or fly speck. Naysayers still rejecting the blemishes? Peel it! Take ugly apples social! 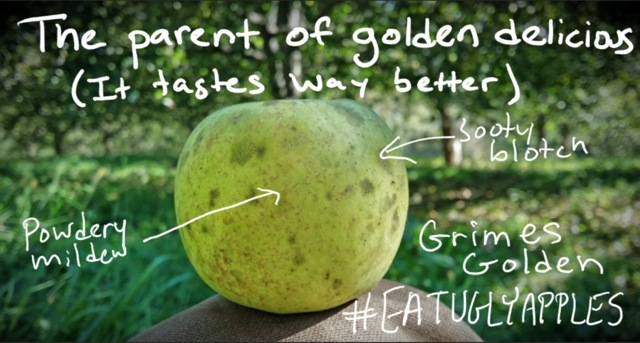 Tweet, Facebook and Instagram the handle #eatuglyapples when consuming a beautifully blemished specimen. Let’s get this out there. Thank you, and may you have many ugly apples in your future! Look for me on the cover of April’s Mindful Magazine! Hitting stands March 1st! 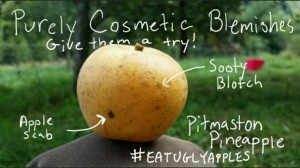 When you see me, tell everyone around to #eatuglyapples!